Today, more and more shoppers are reaching for their smartphones for every step of shopping, from browsing to buying. In fact, Google data revealed a 120% increase in mobile shopping-related searches last year. This opens up outstanding opportunities for brands to reach shoppers with targeted messages at every point of purchase, from search to sale. Now, recent Google research and search data have revealed many important insights on the best ways to connect with mobile shoppers at every stage. 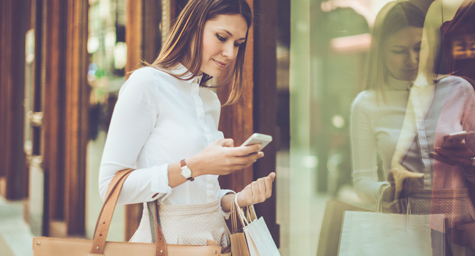 And ThinkwithGoogle.com featured the top five takeaways to bag more mobile shoppers. Around 75% of Target visitors start their shopping experiences on mobile devices. One-third of consumers who click on a Target mobile search ad will visit a Target retail store. About 25% of consumers who click on a Sprint mobile search ad will visit a Sprint retail store. Shoppers are increasingly searching online for local store information. Google research showed that 50% of consumers who searched for local locations of stores on their smartphones went to the store within one day. And 18% of those mobile searches resulted in a purchase. Surprisingly, 25% of shoppers avoid visiting a store if they are unsure of whether a product is available at the location. But retailers can overcome this obstacle by simply using Local Inventory Ads to show a store’s current stock to online searchers. These ads worked for Sears Hometown and Outlet Stores, which had a 122% increase in store visits after using this approach. And bringing in more shoppers brings in higher sales and a greater return on investment, with Local Inventory Ads driving eight dollars worth of in-store sales for every dollar spent. Offering omni-channel points of purchase results in higher spending. Customers purchased an average of 250% more when they shopped at both the online and offline locations of a retailer, according to MasterCard. And omni-channel shoppers were eight times more valuable to Macy’s than single-channel shoppers. According to a Google/Ipsos study, 82% of shoppers consult their smartphones about purchases before making them in a store. These shoppers are searching for ratings, reviews, and recommendations. With this retail research driving consumer purchase, it’s wise for stores to make information instantly accessible by encouraging customers to leave their product feedback online for easy reference. Clearly, mobile is a means to driving shopping behavior. That’s why stores need to make the most of mobile channels and create compelling experiences that let them connect to shoppers at the moments that matter most. Find out what matters in mobile marketing. Contact MDG Advertising.